The founder and General Secretary of Sarvodaya Sri Lanka, Dr A.T. Ariyaratne and Dr Vinya Ariyaratne have been recognised as the Social Entrepreneur for the Year 2014. 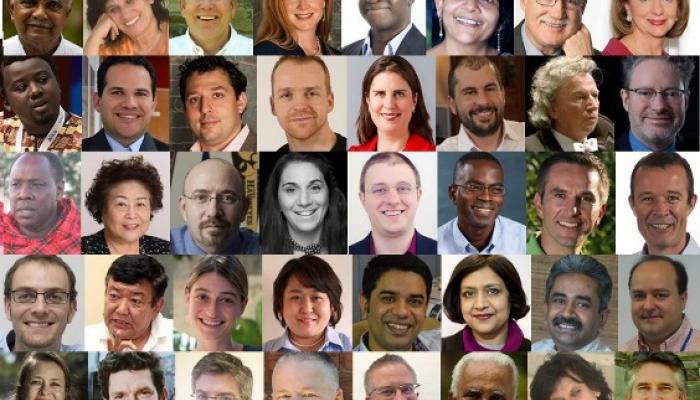 The award organised by the Schwab Foundation and the World Economic Forum recognised thirty seven social entrepreneurs working in health, education, employment, and the environment operating in over 20 countries. 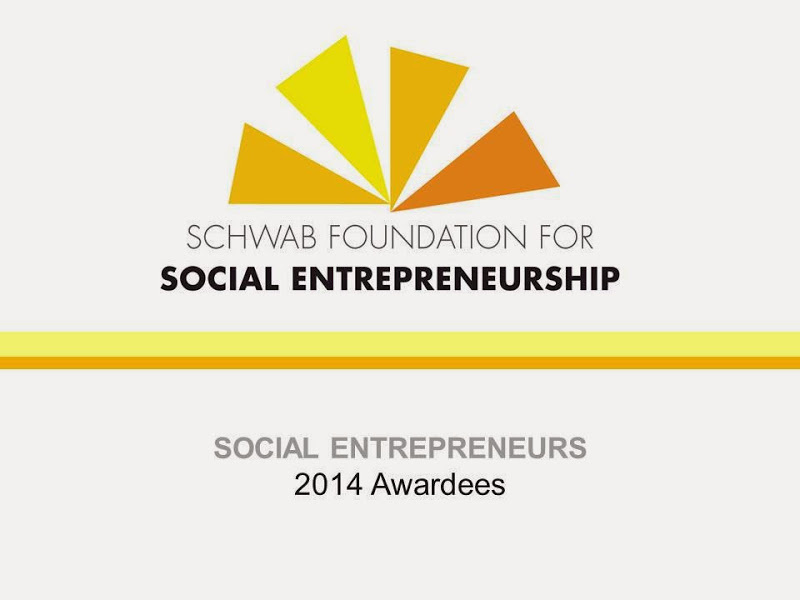 These individuals and organisations join the Schwab Foundation network of outstanding social entrepreneurs. The Schwab Foundation announced the Social Entrepreneurs of the Year 2014 at a livecast session today in collaboration with the The Huffington Post. The awardees will become part of the broader Schwab Foundation community of Social Entrepreneurs, which includes 250 outstanding social entrepreneurs from 60 countries. Schwab Foundation Social Entrepreneurs are fully integrated into the events and initiatives of the World Economic Forum. They contribute actively to and benefit from peer-to-peer exchanges with other social entrepreneurs as well as interactions with top leaders in business, government, civil society and the media. This prestigious award is in recognition of the work done under the banner of social entrepreneurship through the Sarvodaya Organisation. Sarvodaya has a vision of a new social order in a society with no poverty and no affluence based on Gandhian values of truth, non-violence, and self-sacrifice. Such a society is governed by the ideas of participatory democracy with decentralized power and resources (Deshodaya), in which basic human rights and basic needs are sacred and people nurture the natural environmental in which we all live. Among the awardees were Shelly Batra of Operation ASHA (India), Marc Freedman of Encore (USA), Erin Ganju of Room to Read (USA), Donn Tice and Ned Tozun of D.light (USA); Rupert Howes of Marine Stewardship Council (United Kingdom); Tim Jones of Artscape (Canada), Sasha Kramer of Sustainable Organic Integrated Livelihoods (Haiti), Chetna Vijay Sinha of Mann Deshi Bank and Mann Deshi Foundation (India); Charles Edouard Vincent of Emmaus Défi (France); and Allen Wilcox of VillageReach (Mozambique). ‘Awakening of All’ is the literal meaning of ‘Sarvodaya’. The organization has met the emerging needs of our people for over fifty years: breaking down barriers of caste and class (1958), responding to the aftermath of the Tsunami (2004) and heeding the call for peace during conflict (1983-2009). The ‘scale’ of the issues we address are forever dependent on what our people encounter as our ‘organization’ was borne out of the hearts and minds of the people. Having begun on village soil they remain firmly rooted in the village ethic. Currently, comprising of twenty-six district centers with a reach of nearly 15,000 villages they have guided former education, economic and womens’ programs to become organizations in their own right. 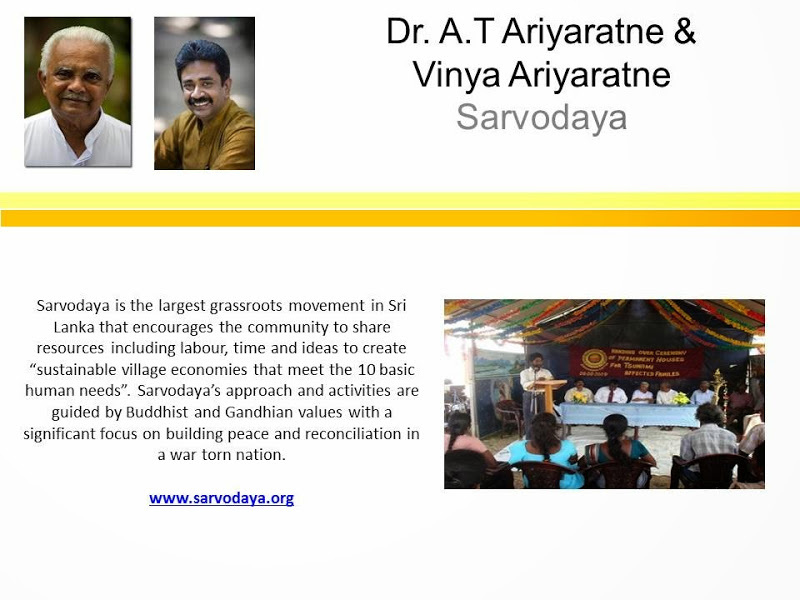 Sarvodaya has an alternative grassroots model of development that has an ethos of volunteerism at its core and delivers all activities through a localized network. Their activities and strategies stem from the concept of awakening (Sarvodaya) and are reinforced by gifting of one’s labor (Shramanda). For Sarvodaya, ‘transformative change’ is a simultaneously engagement of individual, community, national and global arenas. The range of the activities undertaken reflect these four arenas and the many facets for change – economic, social and political– that impinge on both individuals and societies. The Schwab Foundation for Social Entrepreneurship was cofounded by Klaus Schwab, Founder and Executive Chairman of the World Economic Forum, and his wife, Hilde. Since its inception in 2000, the Foundation has been identifying the world’s leading social entrepreneurs and involves the community of 200 award winners in advancing social innovation in collaboration with corporate, government and academic stakeholders. Selected social entrepreneurs of the Schwab Foundation network participate in World Economic Forum events, thus providing unique opportunities for them to connect with business, political and media leaders. We send our deepest respects and hearty congratulations to Drs A T and Vinaya Ariyaratne, as well as Charika Manasinghe and the wonderful staff at Sarvodaya, Visva Niketan and allied institutions. I have personally experienced the spiritual warmth and social consciousness of Sarvodaya, including the unforgettable honor of performing intra-Asian classical and bhakti music in the 50th anniversary celebrations at Bandaranaike Intl Conference Hall and in Visva Niketan. Truly millions will today be rejoicing at the highly deserved award for Social Entrepeneurship.